This canvas was painted at the height of Pissarro’s zeal for the new ideas of Georges Seurat and is one of his most consistently pointillist works, believing that Seurat’s principles were a logical progression from the Impressionists’ treatment of light and colour. Painted during the summer of 1886, this is one of Pissarro’s most consistently pointillist works, He used small points of violet, blue, and deep green for the shadows and stippled dots of yellow, rose, and orange to indicate the dazzling effect of the morning sun. 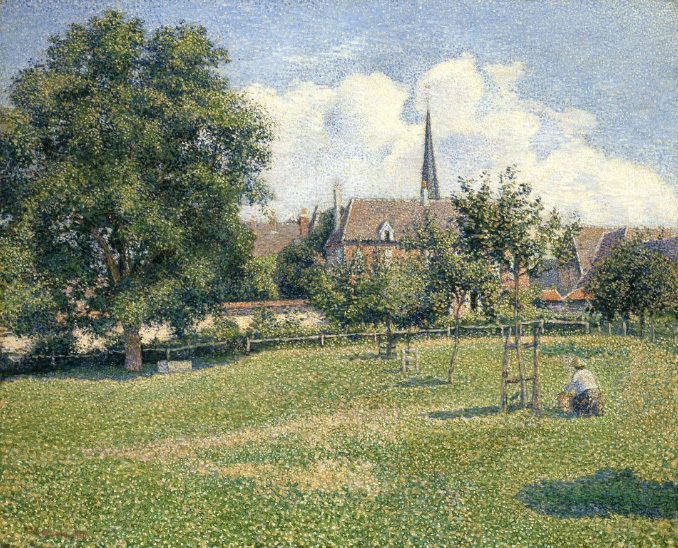 The title refers to his neighbour’s home and to the spire of the church in Eragny, the Normandy village where Pissarro lived with his large family.